The BR-KLASSIK CD box "Bernard Haitink - Portrait" contains a total of 11 CDs with excellent live recordings, which present the longstanding intensive collaboration of the Dutch conductor with the Chor & Symphonieorchester des Bayerischen Rundfunks. To mark the 90th birthday of the eminent conductor Bernard Haitink, this representative portrait – a box set containing a total of eleven CDs – is being released by BR-KLASSIK. These exceptional live recordings document the long-standing and intensive collaboration between the Dutch conductor, the Bavarian Radio Chorus and the Symphonieorchester des Bayerischen Rundfunks. For six decades now, ever since he first conducted a Munich subscription concert in 1958, Bernard Haitink has repeatedly conducted the city’s orchestras – sometimes in the Herkulessaal of the Residenz, sometimes in the Philharmonie im Gasteig. The orchestras’ musicians and singers are just as happy to work with him as the Bayerischer Rundfunk’s sound engineers – a tribute to Bernard Haitink by his long-time recording manager Wolfram Graul can be found in the accompanying booklet. The CD box set provides an excellent overview of their collaboration on masterpieces of the First Viennese School as well as German-Austrian Late Romanticism: outstanding compositions by Beethoven, Bruckner, Haydn and Mahler. The box includes complete recordings of Beethoven’s “Missa solemnis” (CD 1, recorded in 2014), Bruckner’s Symphonies Nos. 5 (CD 2, 2010) and 6 (CD 3, 2017), Haydn’s oratorios “The Seasons” (CDs 4 and 5, 1997) and “The Creation” (CDs 6 and 7, 2013) and Mahler’s Symphonies Nos. 3 (CDs 8 and 9, 2016), No. 4 (CD 10, 2005) and No. 9 (CD 11, 2011). Numerous renowned vocal soloists (including Julia Banse in Mahler’s Symphony No. 4 or Alan Titus, as Simon in Haydn’s “Seasons”) and the Augsburg Domsingknaben (in Mahler’s Symphony No. 3) all perform under Haitink’s direction, together with the Bavarian Radio Chorus and the Symphonieorchester des Bayerischen Rundfunks. 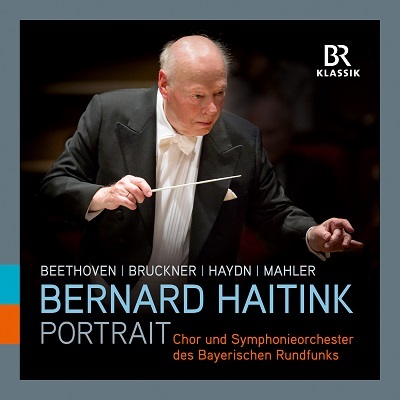 The CD box set is a must for anyone eager to gain an overall impression of the work of the conductor Bernard Haitink and also of his many years of collaboration with the ensembles of the Bayerischer Rundfunk. This well-chosen selection of excellent recordings contains masterpieces of the Classical and Romantic repertoires, in the genres of oratorio and symphony.